All Kadhai dishes are prepared in a traditional Indian wok, cooked in a tomato based sauce with a savory mixture of onions, garlic, and other assorted spices. Large cubes of fresh cauliflower, onions, and green peppers stir-fried together with tomatoes, ginger, garlic, and assorted spices. 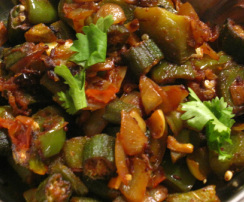 Whole fresh okra stir-fried with onion and green pepper strips, along with tomatoes and assorted spices. Fresh mushrooms, onions, and green peppers with stir-fried with assorted spices. 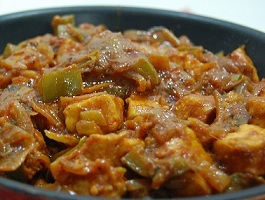 Freshly made cubes of cottage cheese, stir-fried with onions, green peppers, and assorted spices. Marinated cubed pieces of boneless chicken cooked with onions, green peppers, and assorted spices. 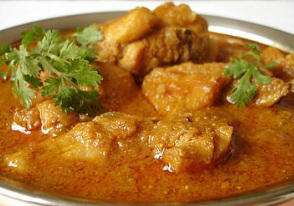 Bone-in cubes of marinated lamb/goat cooked in a tomato sauce with onions, green peppers, and assorted spices. Tender shrimp quickly stir-fried with onions, green peppers, and assorted spices.